The Conservatives’ lead continues to narrow as the Brexit crisis continues, dropping for 4-points to 1-point in a week. 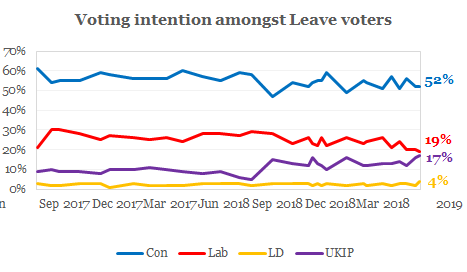 Most of the Tories’ vote loss appears to be amongst Remainers, where they are down 3 points from last week, while remaining stable amongst Leavers. On the other hand, UKIP are now on 17% amongst Leavers, the highest since the general election. This also puts them within touching distance of Labour (on only 19%), who are now in danger of becoming the third party amongst Leave voters. Perception of Theresa May’s handling of Brexit has taken a big knock. This week she has a net approval on Brexit of -40% (21% approve vs 61% disapprove), a whole 10 point down from last week. However, this still doesn’t translate into more support for Jeremy Corbyn’s response: his net approval on Brexit is -49% (16% approve vs 65% disapprove).